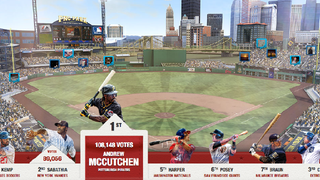 Andrew McCutchen, Pittsburgh's center fielder, is your cover star for MLB 13 The Show, following an extremely brief period in which fans voted on the honor. McCutchen prevailed by nearly 20,000 votes over New York's C.C. Sabathia, and by more than 30,000 votes over Miguel Cabrera of Detroit, the first batter to win the Triple Crown in 44 seasons. Other candidates included (in order of voting) Matt Kemp of Los Angeles, Bryce Harper of Washington, Buster Posey of the World Series Champion San Francisco Giants, and Ryan Braun of Milwaukee. MLB 13 The Show arrives March 5.